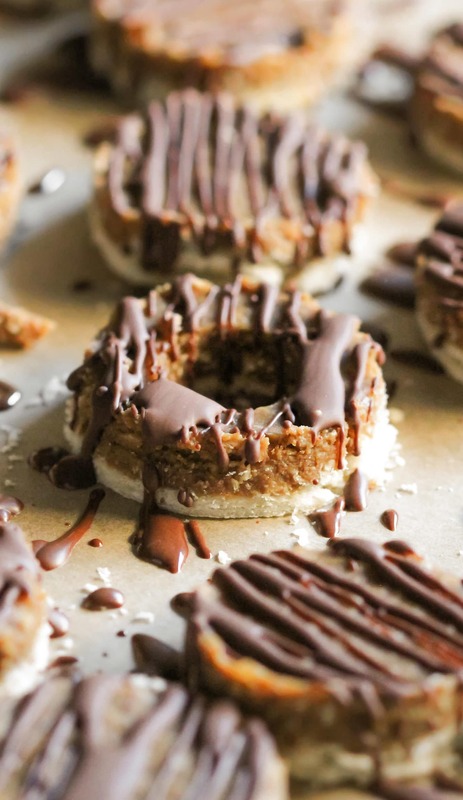 These Guilt Free Homemade Samoas (or do you call them Caramel deLites?) cookies are SO much better than the prepackaged Girl Scouts kind! You get the same shortbread-like base, coconut-caramel topping, and chocolate drizzle, except this DIY recipe is all natural, reduced sugar, dairy free, and vegan. No need for the yucky high-fructose corn syrup, dangerous hydrogenated oil (trans fats), and artificial ingredients. Okay, I’ll admit it. I was a Girl Scout. And I’ll also admit that I’ve eaten FAR more than 20 boxes of Samoas in my lifetime. Sugar, vegetable oil (partially hydrogenated palm kernel and/or cottonseed oil, soybean and palm oil), enriched flour (wheat flour, niacin, reduced iron, thiamin mononitrate [vitamin B1], riboflavin [vitamin b2], folic acid), corn syrup, coconut, sweetened condensed milk (condensed milk, sugar), sorbitol, cocoa, glycerin, invert sugar, cocoa processed with alkali, cornstarch, salt, caramelized sugar, dextrose, soy lecithin, carrageenan, baking soda, monocalcium phosphate, natural and artificial flavors. Girl Scouts seem pop out of nowhere for the sole purpose of making us pack on a few pounds… or maybe they just like torturing us by dangling those amazingly delicious (but putridly artificial) cookies in front of our faces. It’s like they know that deep inside we all want to buy 63 boxes so breakfast, lunch, and dinner will be taken care of for the next three weeks. Ehem, I know I’m not the only one who thought of that, ehem. Thankfully, we don’t have to do that to ourselves because we can now make our own HOMEMADE Samoas! And without the trans fats, excess sugar, and artificial ingredients! These Guilt Free Homemade Samoas (or is it Caramel deLites? I don’t know… who cares, they both taste pretty much the same and are freaking addicting) make it easy to say “no” to that sweet little Girl Scout and the nasty artificial crap she’s trying to sell you. Sorry Girl Scouts, but I’m boycotting you. Bring the rolled pie crust out of the fridge and let it sit at room temp for about 20 minutes, or until soft (if you unroll it cold, it will tear). Unroll the pie crust on top of the parchment lined baking sheet and bake for ~12 minutes, or until just golden brown. In a medium-sized bowl, whisk together the coconut milk, coconut oil, and salt. Set aside. In a saucepan (I used a 4-quart saucepan), add the maple syrup, water, sucanat, and erythritol. Do not stir. Add a candy thermometer to the saucepan, then place the pan over medium-high heat. Without stirring, let the mixture come to a boil. When it reaches 250 degrees Fahrenheit (it takes me ~7 minutes), remove the pan from the heat and whisk in the set aside coconut milk/oil mixture. Return the pan to the heat and let it come to a boil again. When it reaches 266 degrees Fahrenheit (it takes me ~10 minutes), turn the stove off and remove from the heat. Add the baking soda and whisk until completely even. It will bubble, that's normal! Pour the caramel into a nonstick loaf pan or brownie pan and let cool slightly. Whisk in the oat flour, then stir in the shredded coconut. Let cool until it has thickened up and isn't pourable or drippy. Scoop the mixture over the cooled pie crust and spread to the edge of the crust. Refrigerate just until firm. 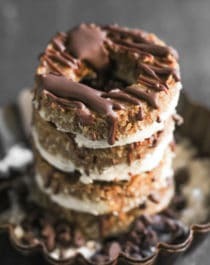 Drizzle the melted chocolate over the Samoas and refrigerate until firm. Serve and enjoy! I punched out tiny circles in some of the Samoas so that they looked like the real thing, but this ended up snapping some of them in half... so I wouldn't recommend doing that haha. Forget Girl Scouts cookies filled with corn syrup and dangerous trans fats. Make their cookies at home! This is amazing 😀 Thanks for the recipe! I was a girl scout too!! And I loooove what you did to make healthy samoas! Amazing as always, girl! These look delicious. But, for people who have a gluten allergy, they need to insure they get certified gluten free oat flour. Most commercial oats are NOT gluten free. I’d like to make these for a friend who is diabetic, what can I replace the sucanat with? Would more Erythritol cause the cooling effect? any suggestions would be greatly appreciated this is one of their favorites! Samoas are my favorite cookie! I’ll have to try this recipe! Pingback: Guilt-Free Samoas Smoothie recipe full of coconut, caramel and chocolate!